Ecotone is a Leading Anechoic Chamber Manufacturers, Semi Anechoic Chambers, Hemi Anechoic Chambers, NVH Test Chambers, Quite Room, Noise and Vibration Testing, ISO 3744, ISO 3745. We Ecotone Systems design and provide Anechoic Chambers, NVH Test Chamber designed according to ISO 3744, ISO 3745 specifications. Our Anechoic Chambers, Noise Test Booths are useful in Automobile Industries & Home Appliances Segment to conduct various testes related to Noise and Vibrations. At Ecotone Systems, we provide great services right from designing, fabricating and installation of an anechoic chamber, Semi Anechoic Chamber from our Expert team. The Ecotone designed chambers have features of that of outside sound attenuating and inside lower cutoff Hz , also provide proper ventilation facilities, temperature control , humidity Control , Lighting , Gas detectors and Building automation system as per design. ECOTONE™ chambers are constructed with noise attenuating outer structures of modular panels and have all interior surfaces lined with PU wedges Foam or Metallic Wedge or Plain absorbing surfaces. Fully Anechoic Chamber has working floors constructed with grating to support heavy test specimens above the floor wedges. This is basically designed to suppress the internal sound reflections and used for acoustical measurements. The effectiveness of an anechoic chamber is measured in dB of rejection, which is the ratio of direct sound to reflected sound inside the room. Our designed anechoic chamber provides performance up to 15 dB(A) and 80 Hz cut off frequency or performance can be design as per client’s requirement to match with desired performance. Ecotone Systems design anechoic chambers for the applications that require precision-level acoustic measurements need to optimize product design and performance of Automobile Components, Home Appliances , Loudspeakers, Microphones , Cell Phones , Information Technology Equipment. 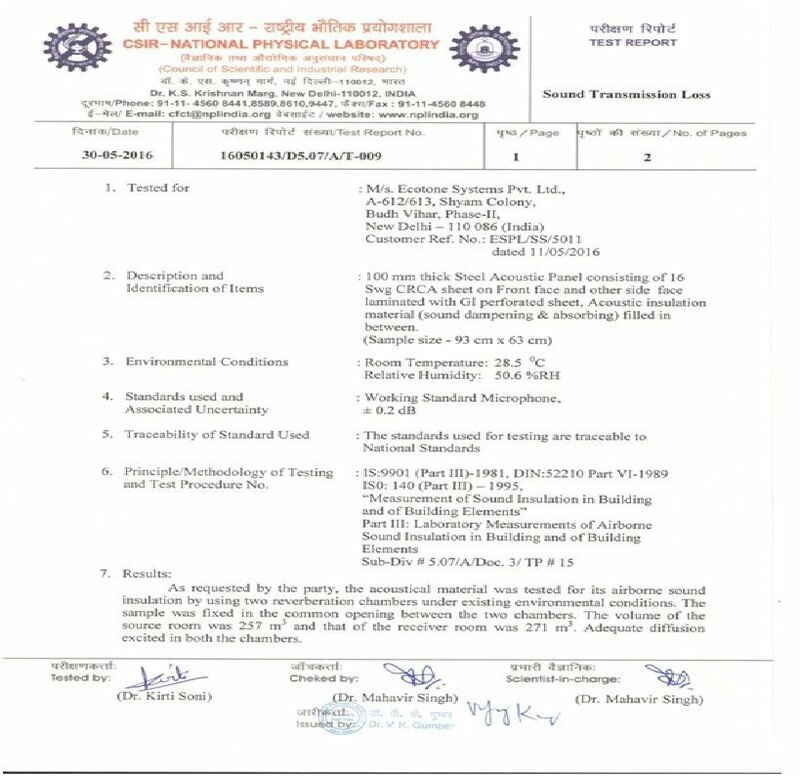 Feasibility Check with proper construction measurements and commissioning. Better Acoustic Performance for each and every room with guarantee. Good expertise in acousticwith the knowledge of civil, architectural, electrical and instrumentation. Proper usage of the anechoic wedge and foam wedges. ISO certified quality control with ISO 9001-2015. Good Quality Materials with Reliable Technology. A room which creates free field conditions but above a reflective plane. Above a certain frequency all sound waves that hit the walls or ceiling of the chamber will be absorbed. This type of chamber is normally used in Auto Parts Testing ,Vehicle testing with a rolling round so that the vehicle may be driven. The semi-anechoic chamber then forms a controlled environment with the surrounding acoustic conditions behaving as a sterile version of the real world. In this way accurate measurements of the sound inside and outside the vehicle can be made under operating conditions. HEMI-ANECHOIC CHAMBERS have acoustical treatment on the walls and ceiling only and feature hard floors with no acoustical treatment. The solid floor of the hemi-anechoic chamber is common for testing large and heavy equipment such as automobiles, construction equipment, ATV’s or white goods and appliances such as refrigerators, washers and dryers, where the normal mode of operation is over a reflective plane such as a floor or hard road surface. Both Hemi-anechoic and Full anechoic chambers can be used in combination with reverberation rooms for transmission loss studies for car body panels and even the noise attenuating characteristics of aircraft fuselage construction. By aligning automatic measuring system, you can save a time margin on measuring. You can measure as much as you like by using the mini anechoic chamber at your location.That gives you a time margin in measuring to clear standards and save a developing cost after all. This mini anechoic chamber provides you a lot of values as much as a low cost, a short-termed construction, no more large space required and a convenience in measurements as just you are. ECOTONE™ Portable Anechoic Chamber are preferred by a communications manufacturer to perform acoustic tests on digital assemblies being developed by their acoustics laboratory. This all steel panel construction using the unique cam locking hardware allows this unit to be manufactured and shipped in 3 sections and quickly assembles on the lab floor. Anechoic Chamber Acoustic Door: – Acoustic Door plays an important role to control outside noise and to achieve desired minimum noise level inside the chamber. These acoustic doors are high STC value door up to 55 STC tested as per IS-9901(Part III) – 1981, DIN 52210 part IV – 1984, ISO: 140 (Part III) – 1995 , some time two no doors fixed on same location to control more noise , one door will open towards inside and one door will open towards outside. Doors are fitted with heavy duty and specially designed hardware and rubber gasket to avoid noise leakage from joint in between door frame and door shutter.